On December 28, 2012, members of HELP and Geauga Catholic Teens For Life traveled from Geauga county to the Byzantine Cultural Center in Tremont to attend the Nativity Akathist, a beautiful prayer service. 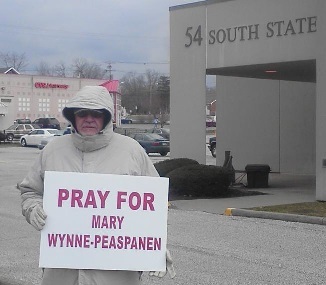 New information is coming to light today about a woman in Cleveland, Ohio who was recently rushed to the hospital following a botched 22-week abortion at the local abortion facility where members of HELP join other pro-lifers to pray. On November 1, 2012, an ambulance rushed a late-term abortion patient to the hospital for the second time in less than five weeks from the Abortion Access Center for Women’s Health in Cleveland, Ohio, operated by Martin Ruddock. Records obtained by Operation Rescue show that a 30-year old woman suffered lacerations and heavy bleeding following the abortion. An abortion facility staffer who called 911 said she was “bleeding bad” and passing large blood clots larger than a 50 cent piece. “Americans are largely unaware of the abortion crisis that faces our nation. While politicians discuss red-herring issues such as whether abortion clinics offer mammograms, shoddy abortion mills are hurting and killing women with alarming regularity, and the average man-on-the-street has no idea this is happening,” said Troy Newman, President of Operation Rescue and Pro-Life Nation. Click here to read more. 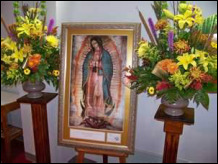 ​The beautiful icon of Our Lady of Guadalupe came to St. Helen for the week, Nov 4-11, 2012. HELP aided the Knights with the prayer service to spread Our Lady’s message and her love. The icon is a 3rd degree relic and has an Apostolic Blessing attached to it. Blessed Pope John Paul II said that we are all one family, despite our different countries and cultures; and that the “renewal of the Church in America will not be possible without the presence of the laity. 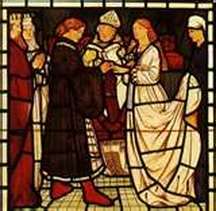 Therefore, they are largely responsible for the future of the Church." Just think of all the children we can help save as we venerate Mary, Queen of the Americas and Patroness of the Unborn. So, where did that beautiful, sunny, warm autumn weather go on Saturday, October 20, 2012? Cold, wind and rain couldn't keep a couple of hundred faithful people from gathering on a quadrant of Cleveland Public Square to hear speakers, sing hymns, gather literature and signage. HELP had a good size contingency in attendance. Teens helped to distribute literature, youngsters proudly carried signs. Everyone though, realize how importanrt this issue is to our faith and our country. Standing simultaneously with thousands of pro-lifers across the United States and Canada, 45 hardy souls sought, through prayer and Christian witness, to be lights in a darkened world and to put an end to the holocaust of killing innocent children. 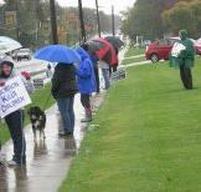 Despite the cold rain on "Respect Life Sunday" October 7, 2012, members of HELP and Geauga Catholic Teens for Life and other Christians formed a peaceful and prayerful public LIFE CHAIN in Chesterland, as well as other sights around northeast Ohio. Their presence provided passersby with a visual statement of Christian solidarity and that the Church supports the sanctity of human life from the moment of conception until the time of natural death. ​HELP received a request for a set of crosses for a display at St. Paschal Baylon Parish in Highland Heights, OH. 2012 is the first time the parish is having a display of this type. Like a well-oiled machine, the HELP team delivered the crosses and quickly had them installed on the parish lawn. Once again volunteers of the pro-life apostolate, HELP, endured the blazing heat to install the familiar white cross displays on the front lawns of St. Helen, St. Edward and St. Lucy Churches. The white crosses represent the 144 babies that lose their lives to abortionists each hour of each day since the Roe vs Wade decision. The memorial is a visual reminder of the ongoing horror in America by which we murder innocent children in their mother’s wombs.. Signs accompany the crosses to further emphasize the message of life and healing to all who walk or drive by the display beginning on the long Labor Day and Geauga County Fair weekend and continuing beyond. 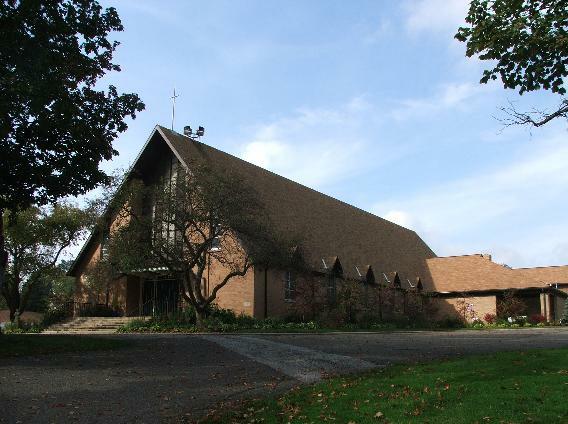 ​On Monday, August 27, our HELP Pro Life Apostolate invited everyone to join with them for the 6:00 pm Mass and Rosary in the Chapel next to St. Edward’s Church, 16150 Center St., Parkman, OH to pray for an end to abortion. 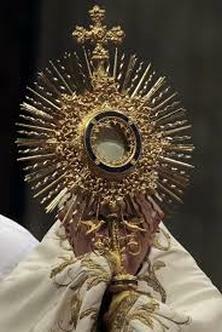 Our best God-given weapons to defeat this evil are the Eucharist and the Rosary. We also prayed for all the men and women who have been hurt by abortion that they may feel the merciful healing of our Lord, Jesus Christ. 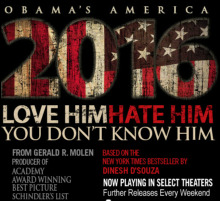 ​When Dinesh D'Souza's new $2.5 million documentary opened on August 17, 2012, members of HELP joined the packed house at the Valley View Cinemark. As many of you know - Dinesh D'Souza has visited Cleveland twice in the past 3 years to participate as a keynote speaker in our "Bringing America Back to Life" Symposium. Mr. D'Souza is hailed as a modern day C.S. Lewis for his ability to logically present the truth in a concise and thoughtful manner. On another note, the two individuals who wanted to illegaly film the documentary just happened to sit down next to a HELP member who is a retired librarian. Bad move! The two copyright infringers were turned into the theater manager. The Family Entertainment and Copyright Act was approved by Congress in April in an effort to curb piracy. One section of the law stipulates that any person who uses an "audiovisual recording device" to tape a movie in a theater can be fined up to $250,000 and imprisoned for up to three years. Distribution could carry additional punishment. 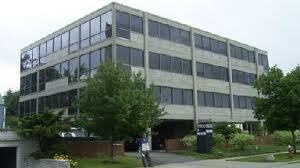 ​On Thursday, August 16, 2012, three Northeast Ohio pastors (Rev. Walter Moss of Foursquare Church in Canton, Rev. Dennis Butts of the House of the Lord in Akron, and Rev. Roscoe Heath of New Praise Ministries in Cleveland) came together to sponsor a forum on abortion urging pastors in the African-American church to use their pulpits to address this moral issue and how it is destroying the African American community in America. Pastor Moss called HELP afterward stating that the recent donations from our group were key in making this forum possible. We will continue to work with these leaders in spreading the word. ​Wow! 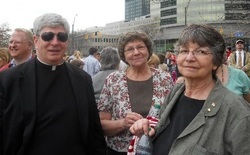 We were really blessed on August 4, 2012, with a large number of people joining members of HELP at Mass, and then later praying the "Rosary for Life" infront of Abortion Access. No cars - No clients - NO DEATHS! ​A peaceful gathering to show support and celebration of God's great gift of marriage was held on July 21, 2012, on Cleveland Public Square. Members of HELP joined people from Cleveland area Churches for speeches, prayers and a short sidewalk march around Public Square. ​On July 16, 2012, members of HELP traveled to Mary Queen of Peace Parish on the west side of Cleveland. They were there to the "Mass of Remembrance" for God's littlest ones who have lost their lives to abortion and for the healing of their mothers and fathers. ​Once again members of HELP from all our cluster parishes, as well as other parishioners, gathered in St. Helen chapel to pray for the protection of the unborn and for a conversion of heart for all involved in the abortion industry. The beautiful service included recitation of the "Rosary for Life." Members of HELP joined the Pro-Life group from St. Mary Parish, Chardon for a Potluck Picnic and Rosary held at Bass Lake Preserve. It's always so nice to get together with other Pro-life groups to share ideas and successes. 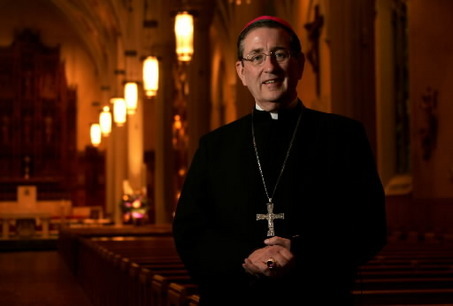 ​Once again, Bishop Richard Lennon of the Diocese of Cleveland delivered a homily on July 4, 2012 that brought the packed cathedral attendees to their feet. The crowd of faithful, including HELP members, listened as the Bishop clearly and forcefully put forth our Church's position on what is clearly an assault on the religious freedom of not only Catholics but millions of other Christians. What the government is asking us to do is reject infallible Church teachings to accommodate citizenry with differing views. This is not something we, as faithful Catholics can do, and still call ourselves Catholic. ​What better way for HELP to spend time on the feast of The Most Holy Body and Blood of Christ (June 10, 2012) than to join with Father David Baugh and hundreds of other members of "the body of Christ" in Benediction and procession from Our Lady of Peace Church down Shaker Blvd. to the two abortion mills - Preterm and Abortion Access! ​Sunny skies and warm weather greeted the local participants in the Nationwide Rally for Religious Freedom held on Friday, June 8, 2012 at 12 noon at the Anthony J Celebrezze Federal Building, 1240 E. 9th St. Cleveland, Ohio. 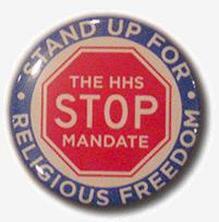 They were there to raise their voice in protest against the administration’s HHS mandate which would force religious organizations to pay for contraceptives, abortion-inducing drugs and even sterilization. ​On a very warm Saturday, May 19, 2012, over a thousand Pro-Lifers gathered outside the statehouse in Columbus, Ohio to encourage our state representatives to move the "Heartbeat Bill" to the floor for a vote. 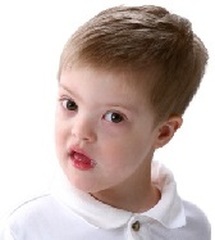 This piece of legislation would ban all abortions from the point at which a fetal heartbeat could be detected. Speakers encouraged those in attendance to contact their legislators to tell them to do the job they were elected to do and take a vote on this bill as it is written. ​Father Burkley celebrated the Mass followed by recitation of the Rosary and Adoration in the Chapel. The gathering at this time is a continuation of a 30-year tradition at St. Edward and was offered for the healing of Jack Montazzoli, an original HELP kid, the cause of Jerome Lejeune and his intercession for Jack and the conversion of all abortion workers. April 28, 2012, Members of HELP and Geauga Catholic Teens for Life travelled to Akron for a meeting of the Pro-Life Youth Congress followed by the annual N E O R T L appreciation dinner. Our youth participated with others from the state-wide organization and adult leaders in a dinner and in listening to keynote speaker Starr Parker. ​The second meeting, April 19, 2012, of Lake-Geauga-Ashtabula pro-life members continued to brainstorm ideas to unify the various groups in a common effort to end abortion in our state. One of the groups focuses is exploring the establishing of a pregnancy center within walking distance of the abortion mills on Shaker Blvd. 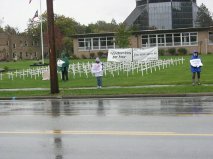 ​Pastor Walter Moss held a second “Day of Mourning” on April 15, 2012 in front of Preterm abortion mill on Shaker Blvd. 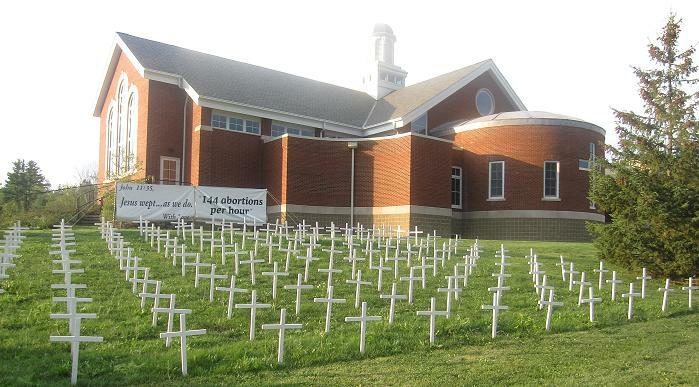 for the lives lost to abortion at the busiest child-killing facility in the state. Pastor Moss was joined by supporters from HELP and other pro-lifers for prayer and witness. 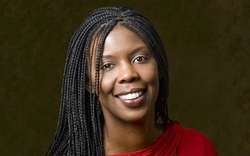 Pastor Moss has assumed the role of leader in the cause of raising awareness and participation by the African American community in the cause of defeating the abortion business in our country. ​Leaders from HELP and area pro-life groups who participated in the Spring 40 Days for Life gathered at Immaculate Conception Church in Willoughby on April 1, 2012, for Holy Mass, dinner and to listen to keynote speaker Fr. Shenan Boquet, President of Human Life International and final reports about the success of the area 40 Days campaign. ​Participants from area Catholic Churches gathered on March 27, 2012 to listen to talks by experts from the insurance field, pro-life lawyers and a professor of moral theology from St. Mary’s Seminary as they addressed the group about the HHS Mandate at the event co-sponsored by the pro-life groups from St. Gabriel's in Concord and St. Mary’s Chardon. The day began at 10 am with Holy Mass in the Cathedral of St. John the Evangelist which Cleveland Bishop Richard Lennon celebrated (and our own Fr. Jay McPhillips concelebrated.) Bishop Lennon delivered a powerful message regarding our religious freedom. He quoted from a letter of President Thomas Jefferson to a group of Ursuline nuns at the time of the Lousiana Purchase. In the letter, Jefferson assured the nuns of the Constitutional protection of religious freedom and added his own promise to uphold and defend those rights. 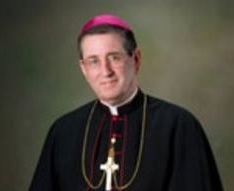 At the end of his remarks, Bishop Lennon received (one of two) very enthusiastic standing ovations. Then, participants proceeded down East 9th Street to the “Free Stamp” park across from the Celebrezze Federal Office tower for a prayer "rally" in defense of religious freedom and to stand up against the Federal Health and Human Services mandate requiring Catholic institutions to pay for abortion-inducing drugs, sterilization, and contraception. People from all over northeast Ohio and representing various faiths joined in demonstrating "United We Stand, the Mandate Must Go!" Next, members of HELP gathered with two African-American pastors, Rev. Walter Moss of New Beginnings Foursquare Gospel Church and Rev. Roscoe Heath of New Praise Ministries on the sidewalk in front of Preterm, the largest abortion provider in Ohio. It was so gratifying to learn of their efforts to get African-Americans involved in the Pro-Life movement. Lastly, about forty-five people from HELP, GCTFL, and St. Helen's attended the opening of the movie, "October Baby" at the Valley View Multiplex. It's a wonderful movie about a young girl who learns that she has been adopted and her struggles to come to terms with the circumstances of her birth. HELP sponsored the opening weekend event. We would highly recommend that you see this movie and encourage your friends and family to do so too. 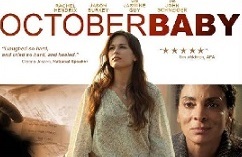 It's not that often that a movie comes along that is not an affront to our Christian values. 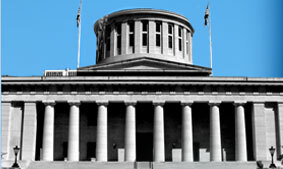 Cleveland Right to Life presented its third annual "Bringing America Back to Life Symposium" on March 9th & 10, 2012. 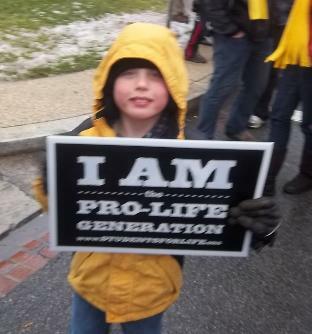 HELP members got to meet and mingle with some of the greatest pro-life crusaders of our times. 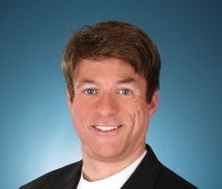 One member - Denver - was particularly honored to meet Michael Voris of RealCatholicTV, as he is a big fan of "The Vortex". HELP gathered information from symposium sessions, meals, and exhibitors; as well as met and shared ideas with fellow pro-life attendees. This annual event held at St. Helen is a wonderful way to spend an evening. Pro-life advocates from HELP's three cluster parishes, other area churches, and members from Pro-Life Youth Congress gathered for a meatloaf dinner and to hear the evening's guest speaker, Fr. 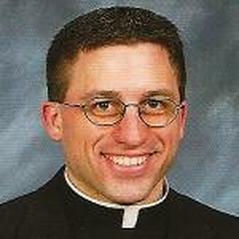 Timothy Kalista, from St. Mary Church, Chardon, OH. Besides the dinner and talk, there were several displays for attendees to peruse: Geauga Catholic Teens for Life had a table display of their activities and PLYC information. The teens also had popular tickets available for a chance to win a new Kia. Paul Ellis had his beautiful Stations of the Cross DVD for sale and viewing. HELP had its "Truth Booth" setup showing the fetal development in ultrasound imagery; and, a table with copies of Abby Johnson's bestselling book, Unplanned, several Pro-life DVD's, Father Kalista's DVD, "LIFE" wristbands and a variety of silly bands for the younger attendees. There was also a table with "40 Days for Life" sign up sheets for the Spring campaign which will kick off Monday, February 20, 2012, at Grace Church, 7393 Pearl Rd., Middleburg Heights, OH. 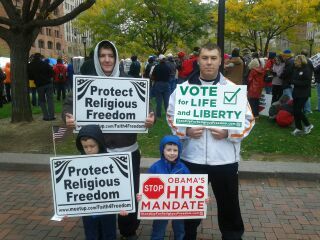 44130; and, petitions for the Ohio Heartbeat Bill. On Sunday, January 15, 2012, hundreds of people gathered at the Border's Corner of Great Lakes Mall in Mentor, Ohio and marched the mile and a half through snowy sidewalks to St. Mary of the Assumption School. Members of HELP and Geauga Catholic Teens For Life marched and then joined those people gathered inside the gymnasium, who could not physically march the route in the bitter winter cold, to visit displays by local pro-life groups and to hear guest speaker Pete Range. HELP's "Truth Booth" was on display as well as GCTFL's table of PLYC literature.